What if there were an extended escrow â€” for example, one year or some other time constraint desired by the buyer and agreeable to the seller? Merge with another firm. Develop a buy-out agreement that will take effect in the future but allows the lawyer to continue contributing to both the law and society (assuming the â€œbuyingâ€� lawyer honors his commitment at the time of eventual retirement by the â€œsellerâ€�). Do not sell and remain in practice until either death or closing the office doors at a future date. 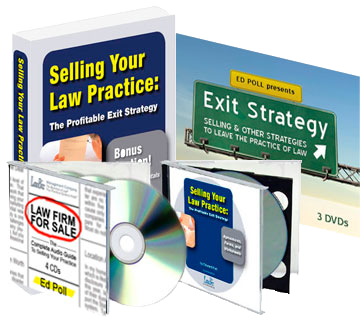 Sell and leave the practice of law to pursue some other activity until death occurs. 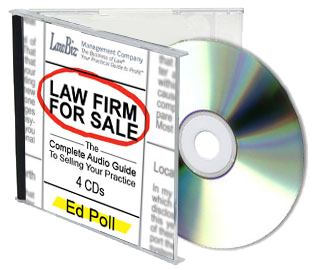 Whether the activity is of minimal interest or is interesting and exciting to the selling lawyer, it frequently fails to address the psychological issues of the selling type-A lawyer personality. The more reasonable interpretation should be that the rule was intended to assist retirement. And, yes, the sale is complete. But the lawyer should be entitled to work for the buyer in order to assist in the transition of client relationships, remain vibrant and contributing to his own well-being, and contribute to the buyer's interest in growing the practice. Remember, we're talking about a sale and retirement, usually of an older lawyer. We're not talking about the sale of a law practice by a younger lawyer who might open a competing practice across the road and steal back his former clients (the great fear projected onto the strawman buyer). Assuming the worst scenario and that the â€œwarpedâ€� (no personal attack intended) Illlinois interpretation of Rule 1.17 is valid, how might the parties deal with the desired sale and transfer of client relationships?